Gunnison-Crested Butte is known for a lot of things: wildflowers, flowy singletrack, monster trout, and the best costume parties this side of New Orleans. Boaters know it for a different reason altogether, waterfalls. Every summer runoff occurs and all our snow fills a series of steep and raging creeks that tumble over the slate bedrock and attract creek boaters from across the country for the iconic Crested Butte Quadruple Crown. 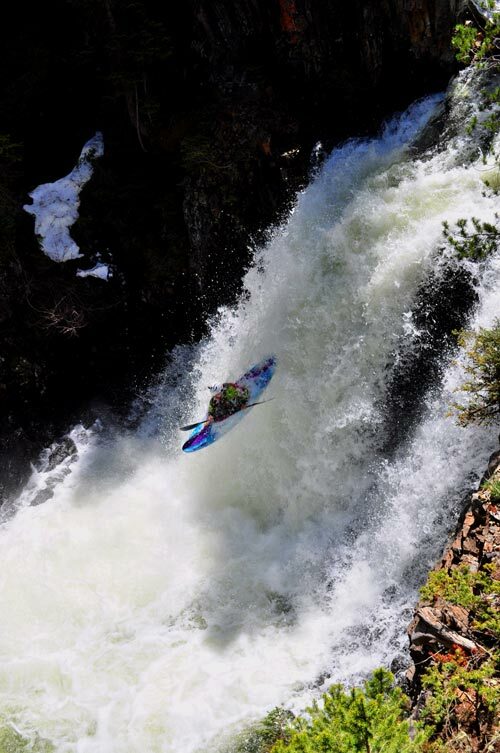 If 20+ ft waterfalls aren’t your thing then have no fear, the Gunnison Country has classic runs for every type of boater, and plenty of family friendly rafting and ducky trips as well. You would be hard-pressed to find a boater worth their salt that hasn’t heard of Oh-Be-Joyful. Located just 5 miles from town with a free BLM campground at the take-out, this run is the place to be during the runoff, and the best place to find partners to explore the Upper Gunnison Watershed. Oh-Be-Joyful is only one of four classic runs, often done in a single day for bragging rights, that are within a 20 minute drive of Crested Butte. Most folks start the Quadruple Crown at the Upper East River since this is the easiest of the 4 and the best warm-up for what’s to come. The Upper East is relatively short and quick. Like most of the Quadruple Crown creeks eddies are hard to come by at medium-high flows. Put in at the bridge just before Gothic and you will instantly be rewarded with a quarter mile of Class III boogie to the main section of the run. 6 drops and slides between 5 and 10 feet go quick. Be sure to scout your take-out since the largest drop in the valley, 50 foot Stupid Falls (one look is enough to understand the name), is just downstream. Someone runs this every year, but it is best dropped at high water. Minimum water levels are above 600 cfs at the USGS East River below Cement Creek gauge. Please be respectful of private property on the East. The 4wd road to the takeout should only be driven when dry. Stay on the road or hike your shuttle. No exceptions. From the Upper East the next stop for most is Daisy Creek, located up the Slate River Road from Oh-Be-Joyful in the shadow of Mineral Point. This creek is an absolute beauty, but is generally not suited to large groups since most eddies are only one or two boats large if you can find them. Put in below the cascading 40 foot waterfall and get ready to be-bop your way down blind ledge drops and slides until you reach the main attraction, 20 foot “Big Woody Falls”. Run this relatively simple waterfall on the left to avoid the rock shelf on the right. Most folks continue down this run until they reach the Slate River and the next Class IV-V creek. Be forewarned of “Rip Yer Head Off” just above the Slate River confluence. This drop has an easily recognized line, but little margin for error. Unlike many of the rapids in our watershed, it involves multiple moves in order to be successful. Look for at least 600 cfs on the USGS Slate River above Baxter Gulch gauge. After floating down the mellow Upper Slate, the action picks back up near the free Forest Service campsites along Slate River Road. The Upper Slate features several drops that are similar to Daisy, but with more space in between, and more wood to avoid. Scout Wicked Wanda before venturing into the canyon. This is the last drop in the run and can be found by following the Forest Service boundary fence down to the river just past the Oh-Be-Joyful campground road. The Upper Slate can be run with the lowest amount of water. A minimum of 350 cfs on the USGS Slate River above Baxter Gulch gauge is recommended. Once you’ve reached the Oh-Be-Joyful campground you have undoubtedly dropped some gradient and run some classic rapids, but don’t get cocky. This creek packs a punch, dropping over 400 ft per mile in it’s short section of drops and monster slides. Some groups will run this after the Upper East so they don’t put on late in the afternoon when the water is highest. One of the excellent things about this creek is that a trail runs along the entire section, allowing you to scout every drop on the hike up. The run starts in the eddy directly above the 15 foot waterfall. Three paddle strokes later you’ll find yourself in the eddy at the bottom. After a short section of Class III-IV the next significant rapid appears. Make the s-turn move and launch off the 8 foot ledge into the eddy below. One more large slide and some small ledge drops will bring you to the big 23 foot waterfall. Be sure to launch this one left of center to avoid the rock ledge on the bottom right. Below this are two more easy slides before a mandatory (depending on the year) portage around the log-jam. Most groups will hike up at this point and get another lap in on the waterfall section before running the three large slides to the bottom. Give thanks to the river gods at the bottom. All three slides are between 50 and 100 yards long with some significant moves to be made. Avalanche is the first and often deals the most carnage. Slide #2 is relatively straight forward, but feeds almost directly into Slide #3. This last slide is the most consequential since the right side often has large logs stacked in it. Be sure to stay left through the top hole to complete your successful Quadruple Crown. Oh-Be-Joyful needs a minimum of 400 cfs on the USGS Slate River above Baxter Gulch gauge to be worth a look. The Taylor River is one of the classic boating rivers of Colorado, but is often overlooked because of its spectacular fishing and similarity to the Arkansas River to the east. The Upper Taylor sections offer fantastic intermediate Class III boating while the Lower Taylor is a beginner’s dream with miles of Class I-II. Since the Taylor is dam controlled you can expect to find boatable flows from mid-May through September. The Upper Taylor is a commercial rafting run that is great for adventurous families. Scenic River Tours and Three Rivers Resort both run trips on this splashy Class III section during the summer. 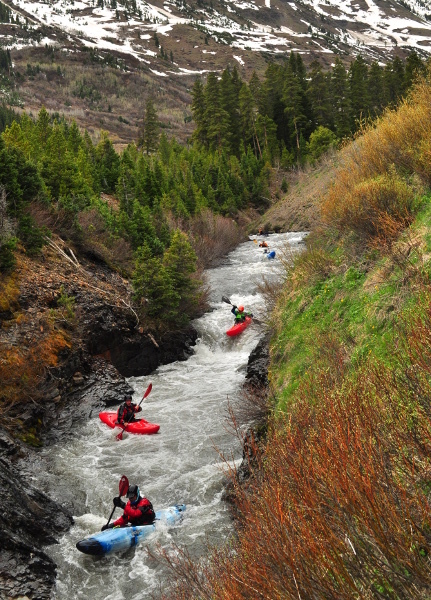 The typical rafting trip on Upper Taylor runs 5 miles from Initiation to South Bank takeout. For the intrepid boater several other put-ins can be used. Above the Initiation put-in is a popular put-in called New Generation that allows boaters to run the only Class IV on the Taylor, Todd’s Slot. Another put-in just downstream from Lottis Creek Campground can make the Upper Taylor a 12 mile Class II-IV run. Be very careful of shifting wood, especially as the flows crank up during the early summer. The Upper Taylor is best from 300-1000 cfs on the USGS Taylor River at Almont gauge. Above 1000cfs the river is very continuous and is Class IV in character throughout. Be aware that at high water a low bridge can be hard to get under in the Lottis Campground to New Generation section. The Middle Taylor is Class II-III, but is not as often run due to private property issues along the river. This section is often run from South Bank (the Upper Taylor take-out) to Five-Mile Bridge. Both spots have great parking lots with bathroom and changing facilities. The runnable levels for the Middle Taylor are the same as the Upper Taylor, but be aware of low bridges as flows rise above 1000 cfs. 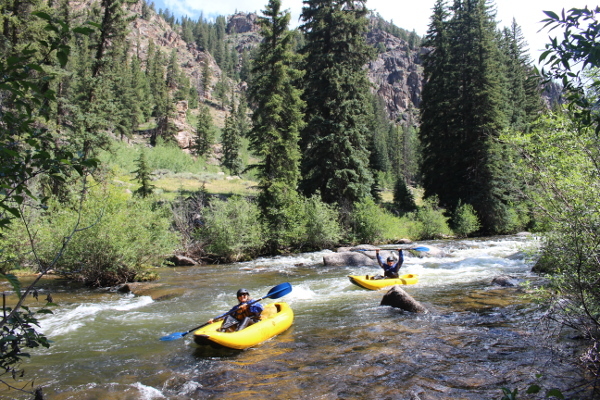 The Lower Taylor is a classic beginner run for those learning to kayak and canoe in the Gunnison Valley. This section of whitewater is also commercially rafted, and is a great alternative to the Upper Taylor for families that want a low-stress and splashy float. This section of the Taylor provides loads of Class I and II with plenty of take-out options and looming granite walls making for an aesthetic piece of whitewater. Most people put in at Five Mile Bridge, but any of the public access points downstream of this will suffice. The take-out is at the confluence of the Taylor and East Rivers in Almont. The minimum level for this section is 300 cfs on the USGS Taylor River at Almont Gauge. 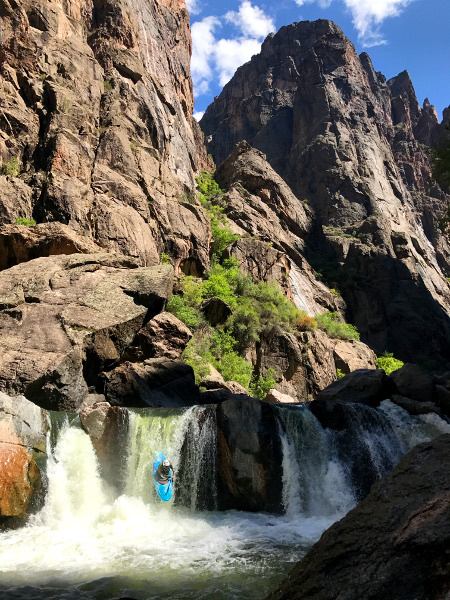 The Gunnison River is a section that is known more for its fishing than its whitewater boating, but that shouldn’t stop you from checking out another great section of whitewater. The Gunnison River is generally very family-friendly and several of the outfitters run rafting trips down the miles of easy Class I and II. 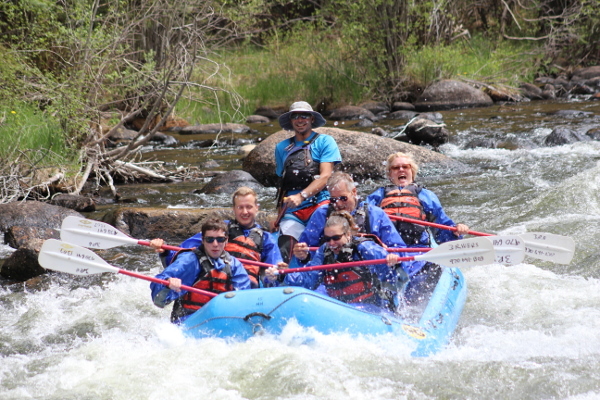 One of the most popular trips is the rafting and dinner trip that runs from Almont to Garlic Mike’s in Gunnison throughout the summer. The Gunnison River is generally divided into two sections. The top section is the easier of the two and runs from Almont to North Bridge just before the city of Gunnison on Highway 135. This section features continuous moving water and some splashy Class I and II rapids with great fishing. The bottom section runs from North Bridge to Riverway Picnic Area. Riverway is also known as McCabe’s Landing to most locals. This section is very much like the first with the exception of the short section through the Gunnison Whitewater Park. Here man-made whitewater features are designed to be a little larger than the natural rapids of the Gunnison. If you’re on a SUP or in a kayak, hang out and play awhile. Nice eddies make easy returns to the surf waves. Once you’ve made it through the Park’s three drops don’t let your guard down because Psychedelic Falls lies downstream and care must be taken to run the right slot through the rapid. When boating on the Gunnison please be courteous of all users, especially people out fishing. Remember that downstream traffic has the right-of-way and to be sensitive about which eddies you are using. Much of the Gunnison runs through private property and it is trespassing to get out of your boat or drop an anchor in many places. For boaters looking for a classic overnight trip through one of the most beautiful and intimidating places in the United States, look no further than the stretch of the Gunnison River through the Black Canyon of the Gunnison National Park. This is a trip that late-night campfire stories are made of. 2,000 ft. granite walls rise up from the rivers edge and monstrous boulders often cause the river to disappear into hidden sieves and siphons. Although all the rapids can be portaged, with the exception of the “easy” 18′ drop, groups should be prepared and skilled enough to run multiple Class III-V rapids with serious consequences scattered throughout. 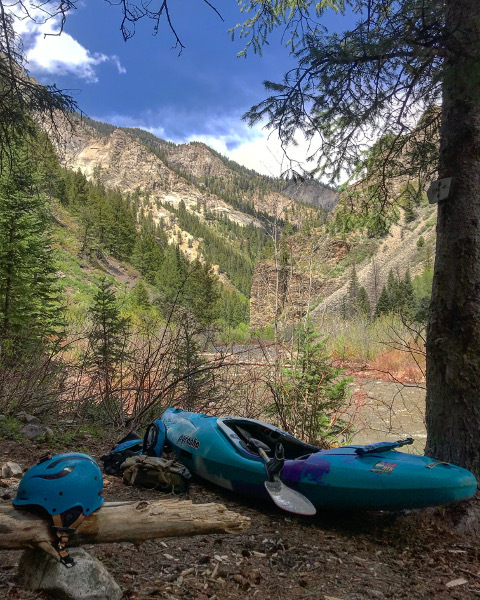 One large mandatory portage is located in the heart of the canyon and involves approximately 1.5 miles of boulder hopping, poison ivy, and at least two ferries across the river to continue the portage. This trip is often done as an overnight, but for talented and fit groups that are familiar with the run it can be done in one day. Most people take out at Chukar Trailhead and hike the one mile trail up to the parking lot. High-clearance vehicles are recommended for the road to Chukar, but 4wd is not required. Skilled Subaru drivers should be cautious but able to make it as well. The best thing about the Black Canyon is that it is dam controlled river and often runs during the shoulder seasons when everything else has gone dry. Look for the USGS Gunnison River below Gunnison Tunnel to be above 500 cfs as a minimum. Between 500 and 700 cfs the run features several extra mandatory portages. Between 700 and 1200 cfs is optimal for most groups and most rapids fill in negating several portages in exchange for some extra Class V.
For those wanting to extend their whitewater trip in the Black Canyon, a long day or an easy overnight trip starts at the Chukar Trail and ends at the Pleasure Park near Delta. Lots of fun Class III and some IV at higher levels. This section of the Black Canyon can be run in a hard shell at levels as low as 300cfs. Fishing in this section is fantastic and a June run may match up with the world famous Father’s Day Hatch bringing browns and rainbows up to the surface, many in the 5#-10# range. The Gunnison Valley is home to several other boatable sections of whitewater within a short drive. The main one mention is the Lake Fork of the Gunnison that runs from Lake City, CO to Blue Mesa Reservoir. The main section to run here is from Red Bridge Campground to Gateview Campground. This section feature lots of Class III and several larger Class IV rapids. The whole run is about 4.5 miles and the road follows it the whole way on a retired railroad grade so you can scout the river as you set shuttle. Optimal flows for the Lake Fork are 500-2000 cfs on the USGS Lake Fork at Gateview gauge. Several opportunities lurk upstream in the Lake Fork drainage for experienced boaters looking to run steep Class IV-VI that doesn’t experience much human visitation. The Cinnamon Gorge of the Lake Fork, Henson Creek, and several others are just upstream of Lake City. Be sure to link up with a knowledgeable boater before attempting most of these as private property and mandatory 50′ foot waterfalls are just some of the challenges that await. For the adventurous Class III boater Cebolla Creek is a great day run from Highway 149 to Blue Mesa. This section isn’t run frequently so be aware of wood and fences across the creek. Although most rapids are only Class II in nature, it is paramount that groups be well-versed in rescue techniques, river signals, and scouting since access into the run can be difficult. Closer to Crested Butte there are several options that involve longer hikes and fewer visitors. Ruby Anthracite, Upper Daisy Creek, and the North Fork of the Slate are all within a short drive of downtown Crested Butte. Ruby Anthracite is often run by hiking in from Kebler Pass Road on Forest Service Trail 836 for 3 miles to the intersection with Ruby Anthracite Creek. Paddle the continuous Class IV from here to Erickson Springs Campground. This riverbed is one of the most dynamic in the state and as a result boulders, trees, and landslides can often change things dramatically from year to year. Upper Daisy Creek is reached by driving or hiking even further up Poverty Gulch. There are only a few extra slides and drops and they are easily seen and scouted on your way up. The North Fork of the Slate is a true section of Class VI located just up the road from the small community of Pittsburgh. Although it has only been run a few times, it is worth looking at if you are in the area and you want to make your hair stand on end. If a nice mellow day on the water is your thing the valley has you covered. Located just minutes from the largest body of water in Colorado, Blue Mesa Reservoir, and covered with numerous alpine lakes there are lots of great options for day or overnight trips. We have a dedicated SUP page with more information on river and lake paddles, as well as access points and facilities. 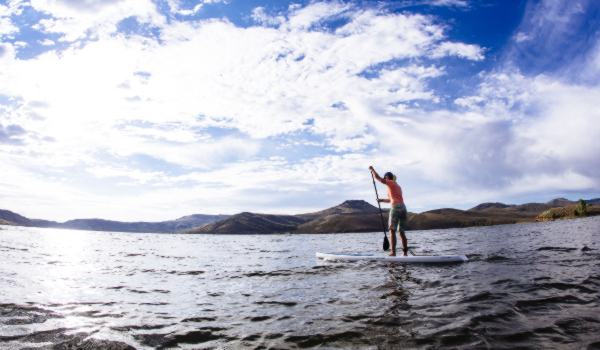 Blue Mesa is the number one place to flatwater paddle in Gunnison County. Numerous access points are available thanks to Curecanti National Recreation Area. Neversink and Beaver Creek are popular access points at the top of the lake where the Gunnison flows in. Further down US 50 are the Dillon Pinnacles and Lake Fork Visitor Center areas that allow you to explore the drainages that run into Lower Blue Mesa. For those looking for a flatwater adventure that involves a little bit more effort take a look at Morrow Point Reservoir. Located just downstream of Blue Mesa and just above the Black Canyon this reservoir offers scenic canyon paddling, paddle-in camping options and no motorized traffic. To get there you will have to hike in on the Pine Creek Trail down 232 stairs before launching your craft. Harder access is all part of the appeal for most adventurous folks though. Taylor Park Reservoir is another phenomenal body water located within an easy drive of Crested Butte or Gunnison. Lake access can be gained at the Taylor Park Marina near the dam or off Forest Service Road 742 in the upper portions of the reservoir. Near Crested Butte are several beautiful places to take out a Stand Up Paddleboard (SUP), canoe, or flatwater kayak. Just up Washington Gulch Road is the access for Meridian (Long) Lake. This natural lake sits on a bench on the Anthracite Mesa and is home to clear blue water and lots of large cutthroat trout. Another popular place to float is the Lower Slate River from Oh-Be-Joyful Campground to Gunsight Pass bridge. This mellow river can often be a raging torrent in the early summer so use caution and plan to boat this reach later in the summer. Lake Irwin is located just 15 minutes from Crested Butte and is the most accessible lake near town. Drive up Kebler Pass Road and follow signs up to the Lake Irwin Campground and Picnic Area. This lake is surrounded by the towering peaks of the Ruby Range and has lots of other family-friendly activities like fishing, hiking, and picnicking around its shores. Two other pristine mountain lakes a little further from Crested Butte offer flatwater options with easy vehicle access. Lost Lake is located off of Kebler Pass Road about 30 minutes from Crested Butte. There is a popular Forest Service Campground here and trail access to three lakes within a short circuit. Emerald Lake is located off Schofield Pass Road past the town of Gothic. The road to Emerald Lake isn’t too bad in dry weather, but is not suitable for most passenger vehicles. High clearance and comfort driving mountain roads are highly recommended. There are two locations for motorized boating in the Gunnison Valley, Blue Mesa and Taylor Park Reservoir. Both offer some of the best fishing access in Colorado as well as gorgeous mountain views and Colorado’s famous summer sunshine. Be aware that mornings can often start with bluebird skies and no wind, but this can quickly change as storms form in the afternoon. Blue Mesa is your best bet if your idea of a day on the lake is tubing, water skiing, or sunbathing on the bow. It sits at a lower elevation so it’s typically a bit warmer. Since it is Colorado’s largest body of water it isn’t hard to find a spot all to yourself for the day. Boat inspections are required at your launch point before slipping into the water and you are required to have a two-day or annual pass. Elk Creek and Lake Fork are the two main boat ramps, but Steven’s Creek, Iola, and Soap Creek are open during the busy summer season. Taylor Park Reservoir is a fair bit smaller than Blue Mesa, but the scenery is off the charts. Surrounded by the Elk Mountains on all sides, it is a great place to pack a picnic and enjoy a day exploring the shoreline. The only boat launch is at the Taylor Park Marina, located just past the dam as you drive up the canyon. Boat rentals are available at the Marina as well.